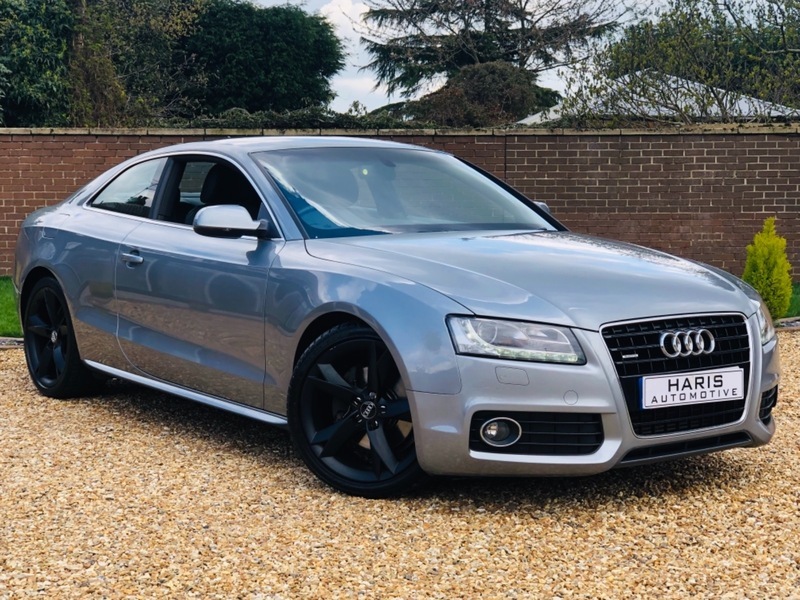 HERE AT HARIS AUTOMOTIVE WE ARE PLEASED TO OFFER THIS STUNNING 3.0 TDI QUATTRO 240 BHP 7-speed S tronic TRANSMISSION + SPORTY COUPE WITH £3,910 WORTH OF OPTIONAL FACTORY EXTRAS!! PRESENTED IN 'QUARTZ GREY METALLIC' WITH BLACK LEATHER HEATED EXTENDING S-LINE EMBOSSED SPORT SEATS + AUTO TIPTRONIC WITH PADDLESHIFT + TECHNOLOGY PACK + 19" ALLOY WHEELS + XENON HEADLIGHTS WITH DRL leds AND AUTOMATIC HEADLIGHT FUNCTION + SATELLITE NAVIGATION + BLUETOOTH PHONE PREPERATION + CRUISE CONTROL + REAR PARKING SENSORS + CD/RADIO/DAB RADIO/SD SLOTS + LEATHER 'S-LINE' MULTI FUNCTIONAL STEERING WHEEL + BANG & OLUFSEN SPEAKER SYSTEM + DRIVER CENTRE LEATHER ARMREST + DUAL DIGITAL CLIMATE CONTROL + AIR CONDITIONING + TRIP COMPUTER + ELECTRIC WINDOWS + ELECTRIC HEATED MIRRORS + ISOFIX POINTS + FOG LIGHTS + HEIGHT ADJUSTABLE SEATS + PUSH KEY START + ANTHRACITE HEAD LINING + MATT BRUSHED ALUMINIUM INTERIOR TRIM + 2 KEYS + SERVICE HISTORY + MOT MARCH 2020 + STUNNING LOOKS VERY NICE CAR YOU WILL NOT BE DISSAPOINTED! !